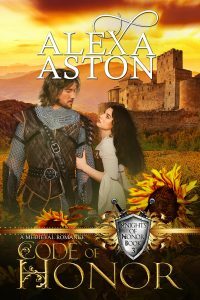 Welcome, Alexa Aston, author of Code of Honor (Book 3 Knights of Honor), a new medieval romance. This historical romance continues my series on medieval knights. Dragonblade Publishing has extended the series from 6 to 10 books since it's proving so popular with medieval readers! I love a great thriller with bits of history thrown in. Steve Berry does a fantastic job of this. Miss Elizabeth Bennet from Pride and Prejudice is the sister of my heart. I'm hard at work on Journey of Honor, the 4th book in my series. It will come out in late June this year. Besides Journey of Honor, I'll release Book 5 in The Knights of Honor. Heart of Honor releases in late October. 1365 A.D. - After the Earl of Sandbourne banishes his supposedly unfaithful wife to a convent, his young son Michael swears never to set foot on the family's estate until after his father's death. Michael will then claim his title as the new earl and restore his beloved mother to a place of honor. Alexa Aston's historical romances use history as a backdrop to place her characters in extraordinary circumstances, where their intense desire for one another grows into the treasured gift of love. A native Texan, Alexa lives with her husband in a Dallas suburb, where she eats her fair share of dark chocolate and plots out stories while she walks every morning. She enjoys reading, watching movies, and can't get enough of Fixer Upper or Game of Thrones. Alexa also writes romantic suspense, western historical, and standalone medieval novels as Lauren Linwood. Thanks so much, Kayelle. I love getting to stop by RLF and visit with your readers. You're the best!